Opportunity youth (also referred to as disconnected youth) are individuals between the age of 16 and 24 who are neither working nor in school. Such youth often leave school or work because of healthcare issues, pregnancy, the need to take care of younger siblings or caretakers, or because they are struggling and disconnected in school. According to a report by Drexel University, it is particularly important for people in this age group to be working or in school because it is a critical time for developing ability, knowledge, skills, and character traits (also known as “human capital”) that are important for career path development later in life. In addition to the future career implications, such youth also face disadvantages from being relatively isolated from society and have a higher chance of engaging in unhealthy behaviors like criminal activity. It is estimated there are currently around 73,000 opportunity youth living in the City of Los Angeles. Currently, 14% of the City's youth between the ages of 16 and 24 are considered opportunity youth. 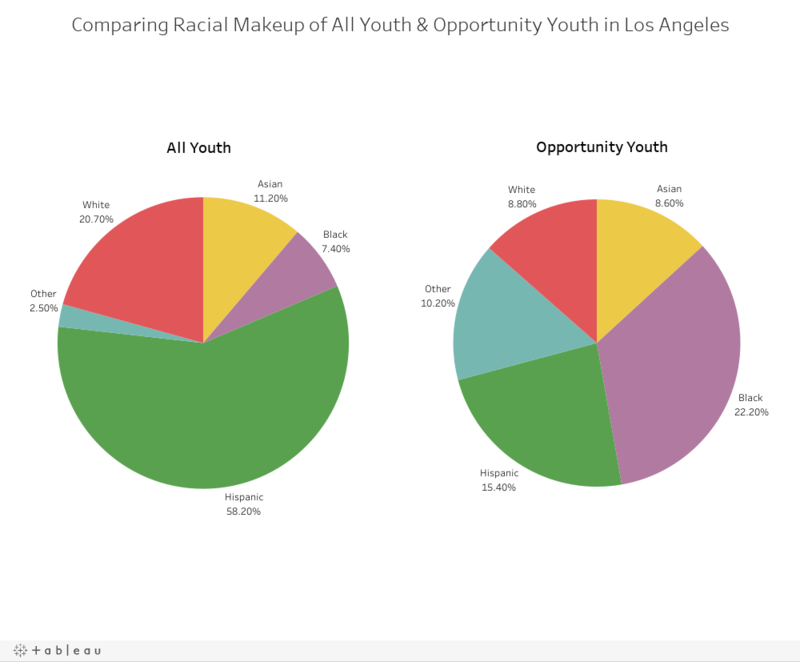 The pie charts below show the racial makeup of all 16 to 24-year-olds in Los Angeles next to the racial makeup of opportunity youth. Although Black youth make up only 7% of 16 to 24-year-olds, they account for 22% of the opportunity youth in the City. Past studies indicate that the disproportionate number of youth of color within this population may be tied to issues like employment discrimination, which serve as additional barriers to entering the labor force. Opportunity youth also disproportionately live in low-income neighborhoods that often lack access to entry-level jobs and post-secondary education. Studies have shown that the neighborhood a young person is raised in affects his or her long-term socioeconomic outcomes, particularly if he or she has lived in that place for a considerable time span. There are clusters of neighborhoods in the San Fernando Valley and Central Los Angeles with high numbers of disconnected youth. Many of these neighborhoods struggle with high unemployment and high school dropout rates. South Los Angeles also has a high concentration of opportunity youth. 20 of the 28 neighborhoods in the South L.A. region of the City have a higher-than-average percent of opportunity youth. In Green Meadows, Vermont Vista, and Watts, opportunity youth make up nearly a quarter of all young people. The unemployment rate in those neighborhoods is between 17 and 18% — significantly higher than the City average of 10%. Furthermore, the high school dropout rate for adults ages 25 and older in these areas is between 20 and 23% — more than double the City average. Other neighborhoods in the South L.A. region have similar education and employment outcomes. With adults of all ages struggling to complete school and find employment in this region, it is no wonder that young people are finding it difficult to do the same. The map below shows the percentage of youth that are opportunity youth by neighborhood. Hover over a neighborhood to see its median household income, high school dropout rate, and unemployment rate. The Mayors Fund for Los Angeles, which convenes private, philanthropic, non-profit and government resources to take on the city’s most pressing challenges, commissioned a 2017 report by the USC Price Center for Social Innovation that analyzed barriers to economic inclusion for opportunity youth in Los Angeles. The report found that entry-level jobs (that would likely be appropriate for disconnected youth) are clustered in several regions including the LAX area, Downtown LA, West. L.A., and Hollywood. While there is a sizable portion of opportunity youth living around the Downtown job cluster, only 18% of the opportunity youth in the city live near any of the areas with high concentrations of entry-level jobs. These findings suggest a mismatch between regions with many opportunity youth and regions with the best employment opportunities for that population. “Los Angeles owes it to opportunity youth to knock down the barriers that keep them out of the job market, which is why the Mayor’s Fund for Los Angeles has launched a pilot to address this mismatch between where the jobs are and where the youth who need them are,” said Deidre Lind, Executive Director of the Fund. “The data collected and analyzed by our partners at USC has been invaluable as we match young people to jobs, drawing on our relationships with the private sector and creative applications of new technology." In addition to the Mayors Fund's work, the City's Economic and Workforce Development Department (EWDD) has been engaged in helping opportunity youth for eight years. The Department estimates that its efforts have contributed to reducing the population by over 40% since 2010. EWDD works with the Los Angeles Unified School District (LAUSD) to reach out to over 16,000 youth who should be in school to help place them in jobs or finish school. The Department also operates 14 "youth development centers" that offer free mentoring and counseling, job and skills training, and tutoring services for 16 to 24-year-olds across the City. EWDD works to help opportunity youth not only with short-term issues they face but also longer-term career and employment prospects. Robert Sainz, EWDD’s Assistant General Manager, said of their efforts for disconnected youth outreach. In 2015, the Obama White House selected Los Angeles as one of nine communities for their Performance Partnership Pilot for Disconnected Youth initiatives (P3). LAP3 will bring together the City, LAUSD, the County, the LA Community College District, and other private and community partners to test innovative strategies for opportunity youth outreach using federal funding. Read more about LAP3’s strategy and goals here. Bertrand, Marianne, and Sendhil Mullainathan. "Are Emily and Greg More Employable Than Lakisha and Jamal? A Field Experiment on Labor Market Discrimination." American Economic Review, 94.4 (2004): 991-1013. Chetty, Raj, Nathaniel Hendren, and Lawrence Katz. “The Effects of Exposure to Better Neighborhoods on Children: New Evidence from the Moving to Opportunity Project.” American Economic Review 106.4 (2016). Fogg, Neeta, and Paul Harrington. 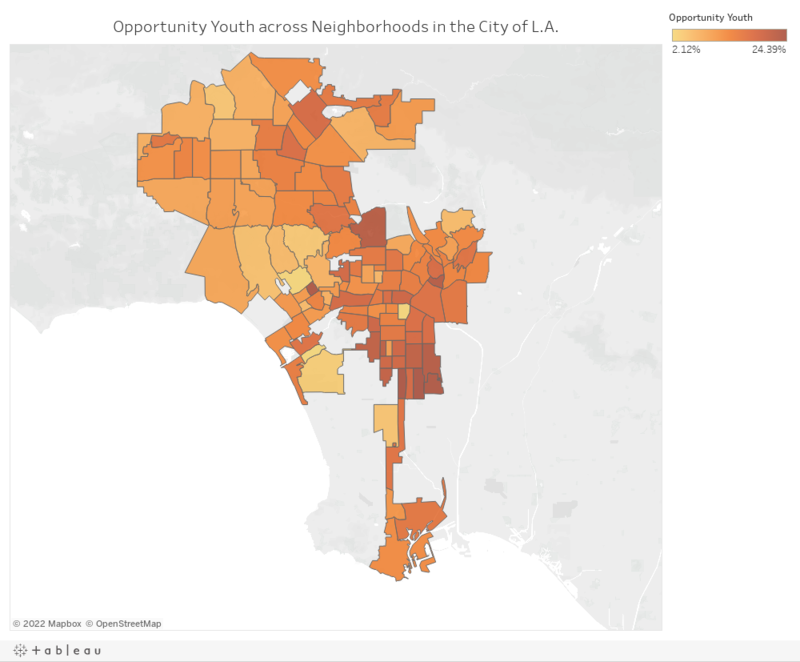 "The Human Capital Investment Gap: Understanding the Diminished Prospects of Disconnected Youth in Los Angeles." Drexel University Center for Labor Markets and Policy (2016). Pager, Devah, Bruce Western, and Bart Bonikowski. “Discrimination in a Low-Wage Labor Market: A Field Experiment.” American Sociological Review 74.5 (2009): 777–799. Despite having a significantly higher pollution burden than the L.A. County average, Irwindale has substantially better asthma and cardiovascular-related health outcomes than the county average.